Arenal Volcano is located in the province of San Carlos. The nearest town to Arenal Volcano is La Fortuna. Around the north side of the volcano, from Arenal Lake to the town of La Fortuna, winds a road with many hotels and restaurants spread out along the way. This site has lots of details on how to get to Arenal, Arenal Volcano, Arenal Lake and La Fortuna. If you are planning on renting a car you have several options to get to Arenal. Even without a map you’ll have no problems getting to La Fortuna, Arenal (eventually!). The most used route is travel along the Inter-American highway heading out of San Jose and turning right at the exit for the small town of San Ramon (well-sign posted). You will pass through La Tigra on the way to La Fortuna. An alternative is to drive through Alajuela or Heredia (perhaps stopping to visit Poas Volcano) and take the scenic route to Varablanca and heading to Aguas Zarcas, then Ciudad Quesada and La Fortuna. A map would be useful for this route. Best way is to drive down the Inter-American Highway and turn off the exit to Cañas. From Cañas follow the signs to Tilaran and then take the beautiful route along Arenal Lake. There are several hotels and restaurants along the route and a popular spot to have a break along the way is in the small village of Nuevo Arenal. Drive from Santa Elena (main village in Monteverde) to Tilaran and then head towards Nuevo Arenal following the fully paved road along Arenal Lake. The route to La Fortuna is sign posted. Taxi-boat-taxi (or sometimes called the jeep-boat-jeep service, although jeeps are no longer used!) is the quickest way to get to Monteverde from Arenal Volcano, only 3 hours.The beautiful scenery makes up for the bumpy car journey....! The taxi-boat-taxi service involves a pick-up from most hotels (located between La Fortuna and Tabacon Report) in the morning or afternoon. The transport is door-to-door to most hotels (but in the rare occasion your hotel is located outside the drop off zone there may be an extra charge). 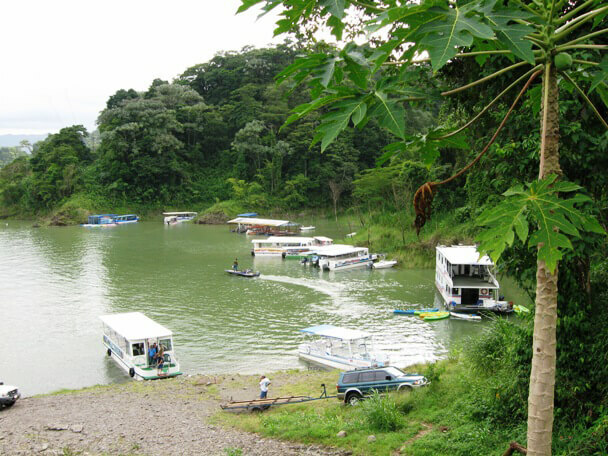 The journey involves a 25 minute drive in a microbus to the dam at Arenal Lake. Then you will walk down to the motorzied, covered and fully-insured boat. 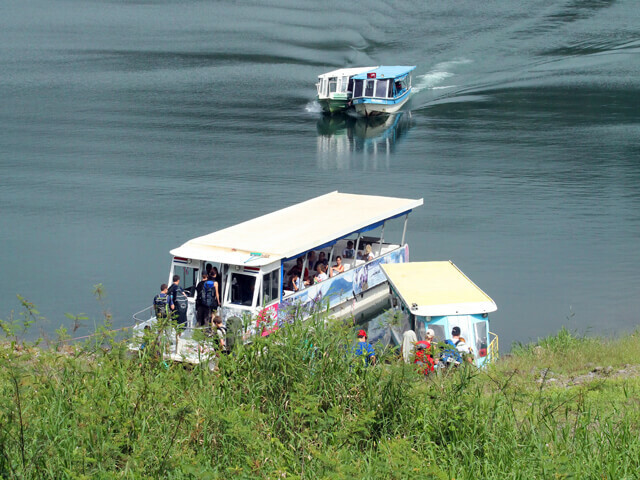 The boat journey is about 30 minutes and you will be stunned by the amazing scenery at Arenal Lake. After the boat ride there will be a bathroom break before the 1.5 hour bumpy journey to Monteverde in a modern microbus. Pick-up times: either 8.30 approx or at around 2.30pm. A combination of the taxi-boat-taxi above but with a wonderful horseback ride added to it. Horseback is a great way to travel with time to enjoy the scenery and the many tropical birds that are attracted to Arenal Lake, plus there are stunning views of Arenal Volcano. 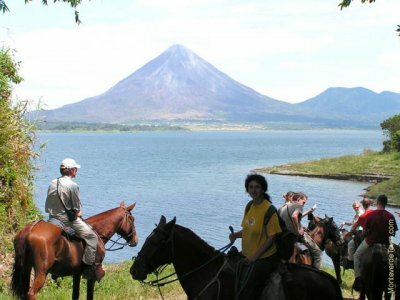 The horseback adventure begins with a pick-up at your hotel, followerd by a boat trip across Arenal Lake where you will met by the horse guides and introduced to your horse. The ride takes about 3 hours with a stop for a fruit and water break. At the end of the horseback ride we continue by van for 45 minutes and then stop at a cafe where you can have drink or bathroom break before conituning the final 25 minutes drive up the mountain to your Monteverde hotel. This horseback ride requires no experience and is a safe route for riders and horses year-round. We can take you to La Fortuna and the Arenal Volcano from San Jose (from your hotel or the airport where our driver will wait for you with a sign with your name on it) by private 4 x 4 or van with AC. Service is door to door. Departs any time. Rates for up to 8 people $149-165,. The least complicated way to to travel. Takes around 3 hours. We can also arrange transfers from other places to Arenal Volcano. We can arrange shuttle transport with modern a/c mini-buses to La Fortuna and Arenal Volcano. Arenal shuttles leaving San Jose depart at approx 8:00 am and 1.00pm. The duration of the trip is approximately 3 hours. .Shuttles can also pick up from other parts of Costa Rica to take you to Arenal Volcano. From San Jose: "Direct" buses leaves daily at 6:15am, 8:40am and 11:30am. From Cuidad Quesada: Bus goes from San Jose to Cuidad Quesada from 05:00-19:30 every hour. Takes a little over two hours. Cuidad Quesada to Fortuna there are buses at 06:00, 10:30, 13:00, 15:30, 17:15 and 18:00. Takes about an hour. 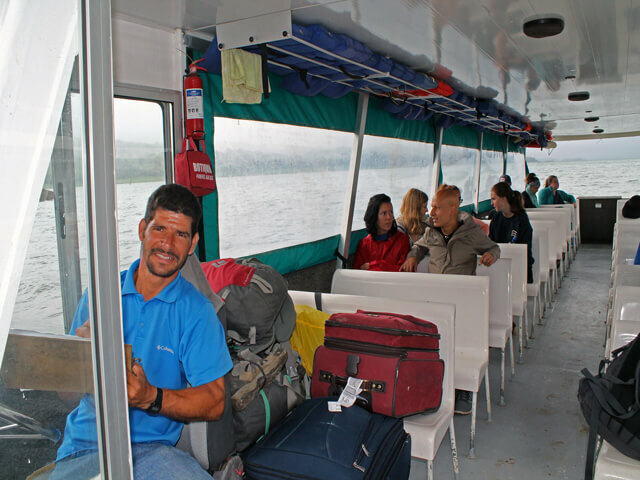 From Tilaran: Buses leave Tilaran for La Fortuna daily at 07:00 am and 12:30 pm. Takes around 2 hours from Tilarán to La Fortuna. Travel to Arenal Volcano Costa Rica! !